Hello. Back after an enforced & festive break. Connection problems and a little too much festive cheer. However, i'm back with some perfect New Years fair for you in the shape of Snuff. If your having a karaoke party this is the one. Hen Night & Gay disco classic, Gloria Gaynor's' 'I Will Survive'. Also a four tops cover, and I hasten to add one of my favourite Snuff songs, 'It Must Be Boring Being In Snuff' which is ripsnorting Punk Rock at it's very best. Get it for that alone, even if your not a cover version kind of guy or gal. 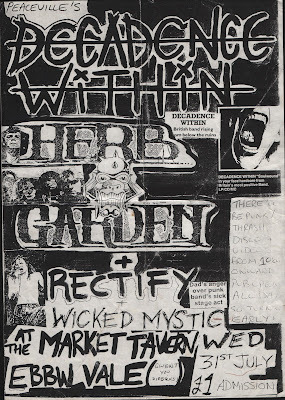 4 tracks on this 1996 deceptive records. Lots of nice pictures of scooters all over this as well. See you next year brothers & sisters, I'm off to get pissed. I'm nothing if not a traditionalist. Happy New Year! If I had to choose a favourite Christmas song. This would be it. From 'Hey Cop, If I Had a Face Like Yours...' on RR Radical Records 1991. The mighty M.D.C. Very festive I think you'll find. It had to happen at some point. Here is my first contribution. 2 tracks from the best that Oi! had to offer, the 4-Skins & The Business and 2 iffy numbers from Max Splodge and Uncle Gal. Click cover to go to The Business official web-site. Still doing it. First E.P. from The Varukers and it's a classic. Bought this after bumping into a couple of punks (a real couple, one male, one female type deal) in the street while on holiday as a kid, one had The Varukers on the back of their jacket, (looking back the paint was probably still wet) the other Discharge. They pointed me in the direction of this fantastic record shop where flicking through the singles I found this. Whenever I pull this single out, I think of that couple as they were really cool with me, even though they would have been quite a few years older than me at the time. I read an article the other day, where someone was talking about how back then, wherever you were, Punks would just start talking to each other in strange towns & cities. It was like that. 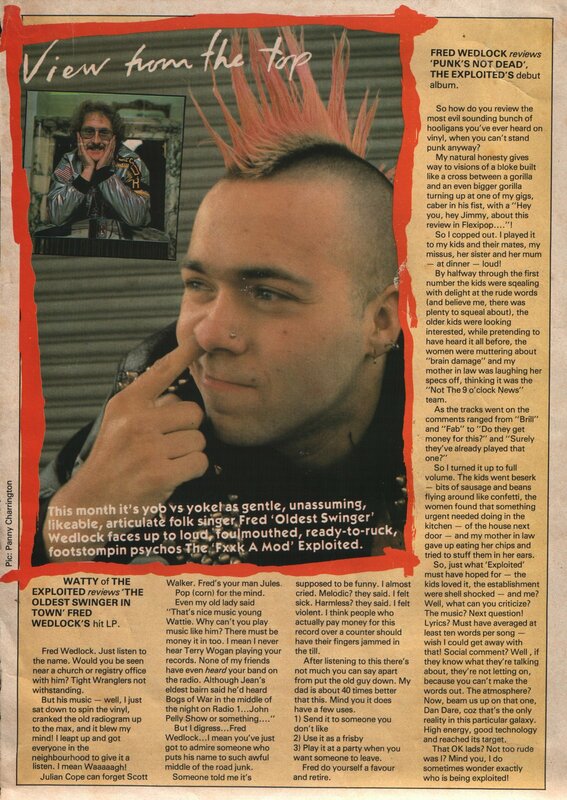 There was a sense of a Punk community. Within twenty minutes of arriving somewhere you'd suss out where the local Punk's were and you'd be sorted for the night, week, however long. I think the word is Altruism. We need more of it back in our lives. Posting this for regular commenter Sascha. The Violators from New Mills, same area as Blitz. Both 'No Future' signed bands adopting the Clockwork Orange style a'la The Adicts at various times. I used to go to college with a lad who was a Clockwork Orange skinhead and he would go to his classes, in full Clockwork Orange make-up in an Alex/Monkey style, with his bowler & his brolly, white shirt & sta-prest & 14 hole Martens. Lecturers were forever sending him off to wash his face. You'd see him in the toilets at ten past nine washing all that white make-up off, complaining it had taken him an hour to do that morning. Click n read. The interview is certainly of the time, so to speak. Lets have a christmas film! 1 hour and 20 minutes long! The Punk Rock Movie by Don Letts. 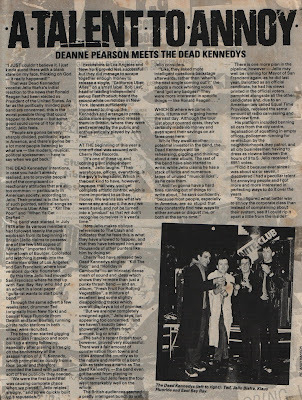 Just so we can all remember that not all journos are necessarily fans (hence the need for zines).Theatre Of Hate getting absolutely slaughtered in an album review for the live LP 'He Who Dares Wins'....Rodney. Is that a Seditionaries shirt I see there Mr. Stan Stammers? Oh, I think it is! Always wanted one of those. 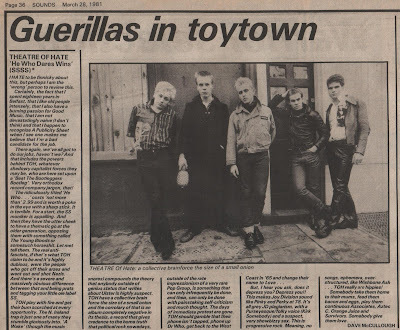 For some great pre-Theatre Of Hate sounds, Brandon's first band, The Pack, pop over to Nuzz Prowling Wolf who has a truly excellent 'Best Of' posted. Includes some of my favourite ever tunes by Mr. Brandon. Can't recommend that enough. Includes an early version of this, which when I first heard it on John Peel completely blew me away. 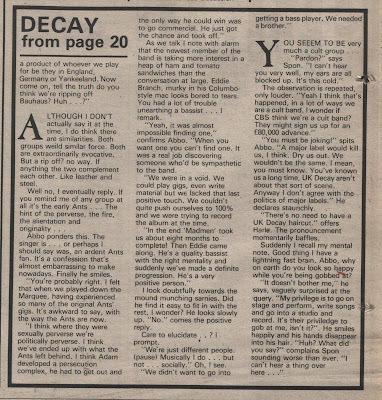 The UK Decay web site doesn't seem to have this one, so here it is in all it's glory for you lovely people. Bit of a kicking for bauhaus & a little mention for Adam & The Ants in this bit. I love Adam & The Ants. Almost christmassy this post. 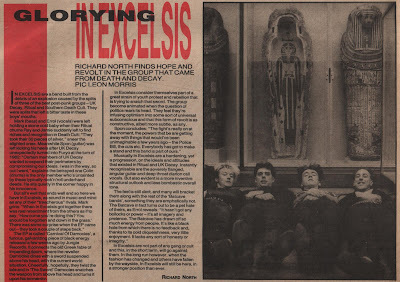 In Excelsis January 1984. This is already on the excellent UK Decay site. But this one is in colour! (well it's got a bit of red on it) With the Peel Session! Again! I'm getting lazy I know. But i'm loving theese old mags at the moment. Even if no one else is. Now this comes in the guise of a gig review. You don't get here an awful lot about said evening though. Most of this 'review' however just concentrates on how great the reviewer thinks Flux are. Which is perfectly acceptable I feel. What a fantastic bill though. Flux, Peni & Subhumans. Once i've actually perfected the art of time travel, I think i'll pop over to The Red Lion in Leytonstone & buy a few pints for under 84p. Click it 'n' read it. As you've probably guessed i've got a new scanner. I've also been up the attic (get the old decorations down innit!) Spied in the corner a little box full of cuttings. So, for the foreseeable future were going all 1981 round here. Scans a plenty. 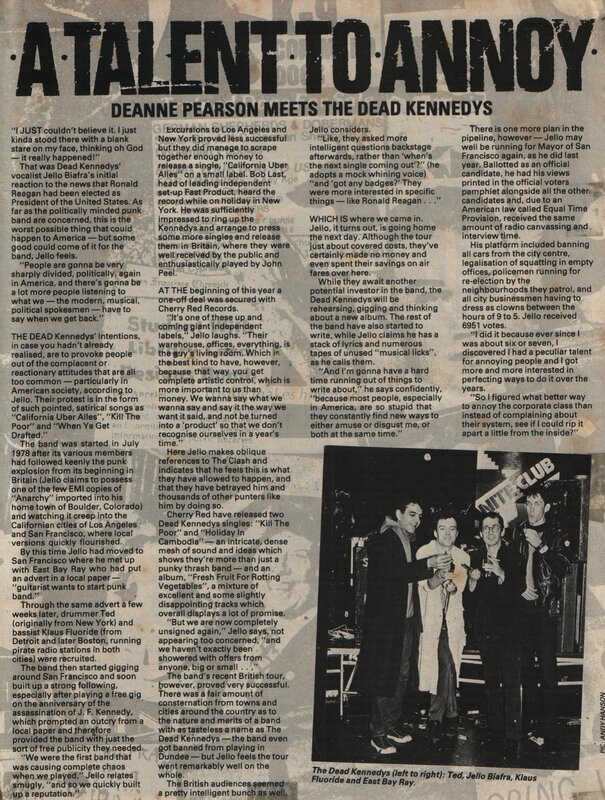 This is from 'Smash Hits' circa 1980-81 (I only kept the cutting) who covered quite a fair slice of punk at the time. I always liked the title of this article and it's something i've tried to perfect for most of my life. Click n read. 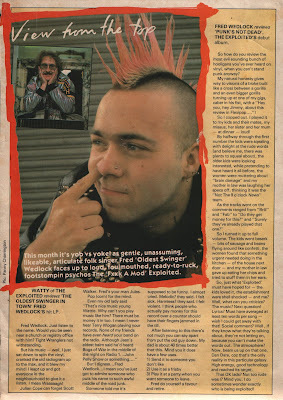 Wattie off of The Exploited with Fred Wedlock none the less! 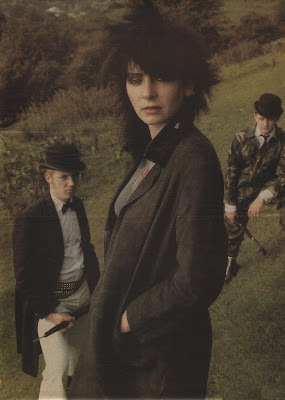 Flexipop magazine 1981 I think. Bizzare combination and if Wattie wrote any of this, well.... immaculate conception i'd say. Anyhow nice pic of Wattie. Strange old Mag yuh Flexipop. Smash Hits with a Flexi disc basically. Have a look. Nice piece from Sounds, a now defunkt music weekly. Complete hatchet job by the Journo, who obviously now considers himself well above this sort of thing. Entertaining. Who would of thought they would have had a complete genre based around them. Read on!